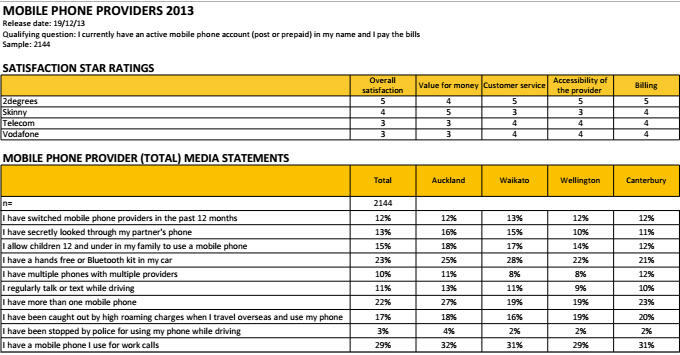 Auckland, 27 December 2013 – The major telco providers were bested by low cost operator 2degrees in a new mobile phone provider customer satisfaction survey from Canstar Blue, released today. Also under the microscope were Kiwis’ mobile phone habits, which showed Gen Ys to have the most dangerous texting/talking while driving habits. This group were also most likely to sneak a peek at their partner’s phone. Derek Bonnar, Canstar New Zealand General Manager says that Gen Ys have some less than desirable habits when it comes to mobile phones. According to studies, a person using a mobile phone while driving – either hands free or hand held – is four times more likely to have a serious crash resulting in hospital attendance. Canstar Blue has tracked mobile phone use while driving for the past two years, and the incidence of text/talk while driving has not worsened during 2013. With the holiday driving season approaching, Bonnar says it is a timely reminder of the dangers of being distracted on road trips. The temptation to spy on one’s partner was strongest for Gen Ys, with 1 in 4 confessing to secretly looking through their partner’s phone. Baby Boomers were the most trusting with only 5% peeking at their partner’s phone. Bonnar says that it would be hard to imagine the mobile phone sector without 2degrees. Canstar Blue commissions Research Now to regularly survey 2,500 New Zealand consumers to measure their satisfaction across a range of products and services. 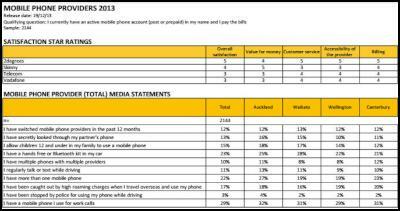 The outcomes reported here are the results from a survey of consumers who have an active mobile phone account (post or prepaid) and pay the bills themselves, in this case, 2,144 people. Canstar Blue is a division of financial research and ratings company, CANSTAR, which has been operating in New Zealand for nearly a decade. Canstar Blue uses market research to determine customer satisfaction ratings across a range of products and services in New Zealand to help consumers make the best purchasing decisions for their needs. Canstar Blue conducts similar research in Australia. New ratings are added regularly. Results are freely available to consumers who are encouraged to use the ratings as a guide to product excellence. The results can be seen at www.canstarblue.co.nz. Founded in 1992, CANSTAR Pty Limited is Australia and New Zealand’s premier researcher of retail finance information for over 350 institutions such as banks, building societies, credit unions, finance companies, brokers, mortgage originators, life companies and finance related internet portals. CANSTAR customers use the extensive database for competitor analysis as well as a means of disseminating their product range. This information is also distributed to print and electronic media for publication and to agents, accountants, brokers and internet portals for use in advising their clients.